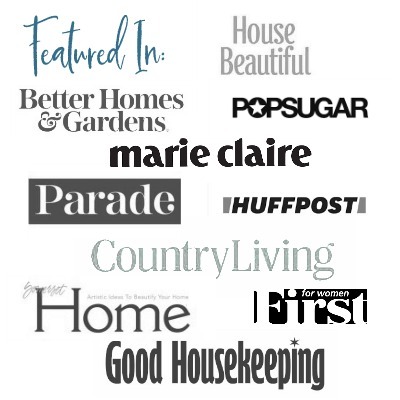 It’s time for our quarterly creative blogger challenge. This one is lead by Susan of Momcrieff to create or update something with mod podge and fabric. It’s been a long time since I’ve decoupaged but I was very excited to use some of my pretty fabric stash for this challenge. I chose to decorate these plastic bins left to me from my daughter when she finished college. They are great for storing so many of my craft supplies and other items in my office. Apparently this was originally a cart with wheels, as you can see from the label. Now it’s just a set of drawers but that’s okay, because I don’t think it would roll around too well on my carpeted floor. The first thing I did was lay out the fabric in a pattern I liked for the drawers. This fabric comes from a beautiful charm pack, designed by Heather Bailey, called “Fresh Cut.” Charm packs are so fun because they were created to work together. I’ve bought a few and have been finding fun ways to craft with them. You can find more ways to craft with charm packs here. Start with the handles by placing the fabric on the inside and tracing around the area with a pencil. Cut out the pattern for the handle. 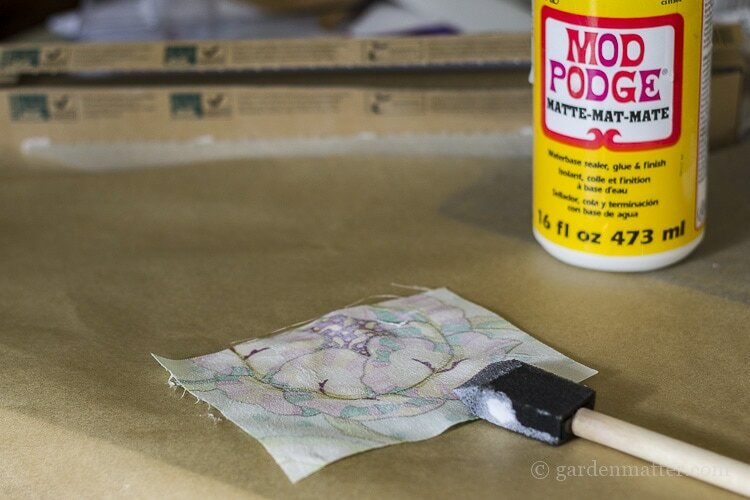 Spread some mod podge directly on the plastic and place the fabric inside. Next place the left side fabric piece over the area you want and trace the edges with a pencil or tailor’s chalk, and cut out. This time I spread the mod podge on the fabric, then pressed it into place on the drawer. Continue with the same technique on the right side. The middle section is similar, but you need to cut around the handle. Using a pencil rub the edges of the opening and cut around it. Add mod podge and smooth into place. Follow the same process for the other drawers. Trim threads add let dry for several hours. I did not seal this project with additional mod podge. If I thought it was going to be heavily used I probably would. I do love the way it turned out, and it’s great to have something so pretty to look at while I work. I bet my daughter will want it back now. Now let’s see what the others have created with mod podge and fabric. Great idea and so easy to make it beautiful. I too have some of these and now I will make them beautiful. You could also put some thicker and make a trivet to serve a hot dish. I agree a trivet would be a great idea with this fabric. I actually have that idea on my list of things to do. Love this idea. Have some of those in my craft room, we will be moving and I’m taking them for my new craft area. Going to do this and it will be really stylish! Thanks for the wonderful idea. This is what I love about the challenges. I would have never done this without the challenge and now I love my pretty container. I’m so glad you liked the project and know that your new craft room will look stunning. I have two of those drawers and was seriously thinking of getting rid of them. I’ve never been a fan of the plastic look they have. I have scraps of fabric and now I have some inspiration with what I’m going to do with these drawers this weekend. Thank you! These will no longer need to be banished to the darkest corners of my closets! I know, right? I can’t believe it took me this long to try it. Thanks for the inspiration. I now love these drawers. This is so pretty Patti….I have these same storage units so I can’t wait to add this cuteness to them. Great job! This simple challenge has us all rethinking things all over the house. Happy Spring and have a great week. What a wonderful idea for sprucing up an ordinary storage tower. I have one of these in the garage, and now I’ll be digging it out! I love the fabrics you used; they are so bright and fun! I’m so glad you like the project. It’s one of those, “I’m so glad I was challenge to do this,” things because I love it too and would probably never get around to doing it otherwise. Now I have a use for all my charm pack addictions. This is so creative, Patti. It just so happens… 🙂 that I have a few of these in my craft room, all white and blah! I’ve never thought of dressing them up like this, but I’m so inspired by your project! I’m redecorating my craft room in a beach theme and I’m going to take this idea and modify it with some beachy fabric. Thanks for the inspiration! Happy spring to you, friend! A beach themed craft room sounds fantastic. You’ll have to show me some pics when you are done. I’m not surprised that anyone with college kids has one of these. They are great for extra storage and even work great as a nightstand. In fact, I’m thinking of purchasing another one with the wheels for photo shots. These color swatches are awesome and you put them together is such a uniformed style, I like that and yes your daughter will probably want it back so when she comes to visit just turn it around, LOL. As always fun working with you Patti and happy spring. Turn it around. Lol I love it! What a nice way to start the first day of spring with such a wonderful group of people!! Thank you and I’m with you. Can’t wait to get out in the dirt. The forecast for my area says we will be having a few days of warm temps so spring clean up in definitely on my mind.